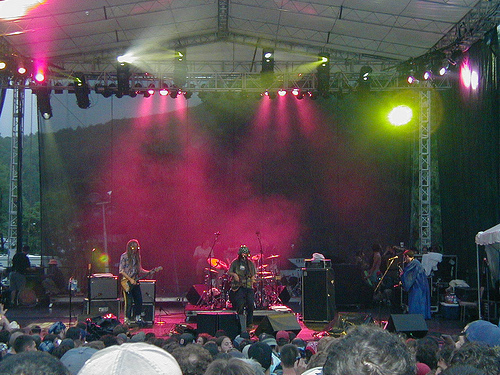 In the Summer of 2001, I had just graduated high school and had started seeing various jambands locally and was excited to break my festival hymen at the Berkshire Mountain Music Festival. Since Phish had played it’s last show the Fall before that, I had been spending the early half of 2001 branching out seeing all and any jambands that came to the area. I had seen Trey Anastasio’s first non-Phish show at the Orpheum in Boston and a week later, saw my first moe. concert at the same venue. I had also seen Gov’t Mule at Lupo’s in Providence and an aftershow featuring the Psychedelic Breakfast at the Met Cafe next door. Yet, none of these shows would totally prepare me for my first festival experience. My brother had gone to the Gathering of the Vibes earlier that summer and he was nice enough to call the house and leave messages on my answering machine of the Disco Biscuits and Les Claypool’s Frog Brigade sets. Those minute long snippets on my answering machine had me as excited I can be to finally arrive at my first music festival. Unfortunately, the day that would happen, we were way behind schedule due to waiting to stockpile various substances, so we got there late on Friday. We got to the festival grounds as it was getting dark and scampered to find a place in the back of a tent filled field to pitch our own tents. We could hear Soulive on the main-stage, but duty called and we waited to finish setting everything up before venturing out to see music. Fortunately for us, our first band we got to actually see was Leftover Salmon’s late-night set in one of the ski lodges. Now, I did not know that at the time, but since then I’ve grown to find out that Vince Herman of Leftover Salmon is basically the Festival Master General in the jamband scene. He got us pumped up for the music left to come for the rest of the weekend and supplied us with a late-night hootenanny get down. Come the morning and the sunlight, I finally got to see the seedy underbelly that belied Berkfest. Now Berkfest was put on by Gamelan Productions, the same company that brought us High-Sierra Music Festival, but if there are two things in common between these festivals, its that they are festivals and they have absolutely nothing else in common. I made my way out to “Shakedown Street” to hear nothing but nitrous tanks running every hour of the day, people selling bags of cocaine out in the open, and even a camping area we affectionately referred to as the Heroin Woods. People openly doing cocaine, heroin, and other drugs like “dust” was completely foreign to me. Usually you had to do that kinda stuff on the down low, but not at Berkfest. There were cops there, but honestly they didn’t do a damn thing so long as you didn’t get in the way of their horses. I even saw someone I had met at a post-party for that summer’s Trey Anastasio Band show smashed over the head with a Captain Morgan bottle, but come to find out he was found stealing stuff from someone’s tent, so hippy martial law came into affect. Now back to the music. Luckily a friend of ours had his tent set up at the very top of the hill where the stage was at the very bottom. So we mostly spent our afternoons, chilling out by our friend’s tent listening to the bands way down below. This is essentially how I listened to my first Sound Tribe Sector Nine, Spearhead and Yonder Mountain String Band sets. I would make my way down the hill for various sets throughout the weekend including Strangefolk, The Word and Robert Randolph’s Family Band. Occasionally we would make our way into the ski lodges to see sets from bands like the Psychedelic Breakfast and the Slip. The highlight of the weekend was moe.’s 3 hour set on Saturday night. We had set ourselves up a couple heads away from the stage during Strangefolk’s set and found a group of other moe.rons to get mentally ready for the headlining set with. moe. took the stage and the mountainside seemed to be at capacity. They led us off with a Plane Crash to get the crowd riled up, what would follow would end up being one of my favorite festival sets from any band, ever. They were all business that night and didn’t stop for what seemed like forever. Actually, the second half of the set consisted of a 4 song Moth sandwich that took over an hour and a half for them to finish. By the time they had finished, I was dead tired, so we and our new moe. fan friends headed back to camp where we joked and consumed various goodies for the remainder of the night. The highlight of Sunday’s lineup was Les Claypool’s Frog Brigade’s headlining set. He came out in a giant green monster costume that had been patrolling festival grounds all weekend urging fans to clean up after themselves. His set was they typical 2001 Claypool set starting with Thela Hun Ginjeet and including favorites like Highball with the Devil and covers like David Bowie’s Space Oddity and the B-52’s Planet Claire. As the Berkfest Allstar Jam started(which included John Medseki and various other well known musicians): we packed up camp and made a run for it, so we could sleep cleanly and dry in our own bed’s that night, but forever that festival would leave a huge impact on me. Berkfest only lasted a couple more years before being shut down by locals who complained of the seedy environment it brought. They were right, even as an attendee, Berkfest could be a scary place, but the music made that all better. It was a year before Bonnaroo started and didn’t have any giant sponsors, but the fans still came out in droves and the annual music lineups there were always top notch. It certainly wasn’t for the weak at heart and the event t-shirt calling it “Berkfest of Champions” was more true than the designer probably assumed. If you could survive that August weekend in the Berkshire Mountains, you truly were a champion. i did all the berkfests. i even slung beer for magic hat one year. i guess may i am a warrior?? there were a few good things that came out of those. i met some really wonderful people at them and two of my friends met there and are now married and have two little girls. i do agree that it got a bit too sketchy towards the end. i loved going but it got to be too much. glad you weren’t completely turned off to festivals because of it!